MDF doors aren’t necessarily exciting but they do offer a cost effective, attractive and stable product that can be manufactured quickly and in a vast number of colors and options. ACT, Inc. has been manufacturing MDF doors since 2004 and as a result we are industry experts on the technology and processes to get the project done quickly and correctly. While solid wood doors are beautiful and distinctive in their appearance there are times when the fact that they are a natural wood product makes them less than desirable, for instance in situations where humidity or temperature fluctuations are expected solid wood doors may tend to shrink, crack, or expand resulting in them becoming unattractive or even malfunctioning. Additionally, the traditional method of assembling a raised wood panel utilizes many joints which are all potential failure spots when the doors are utilized in certain environments. MDF doors on the other hand are highly stable in a wide range of environmental conditions and because of the material properties of MDF they are typically milled out of a solid piece of material, eliminating the many joints and components inherent in a solid wood door, they take paint well and because there are no joints the chances of a failure in the paint due to expansion and contraction are generally eliminated. Lastly MDF doors are typically a better value than solid wood from a costing perspective. Several factors contribute to this- when using solid wood care must be taken to ensure that grains match, that knots and other defects are identified and eliminated, and that variations in coloration that will affect the final product are considered. Since wood is a natural product these issues are unavoidable and the only solution is to absorb the waste from eliminating these conditions as part of the cost basis for the doors. 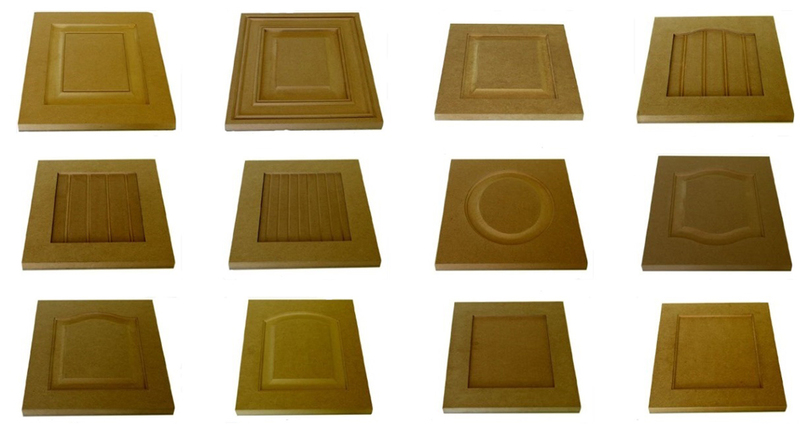 MDF does not share these issues, unless due to a manufacturing defect MDF will be constant from sheet to sheet and will typically yield perfect product time after time. Whether you need a single kitchen set or a commercial building full of cabinet doors, ACT, Inc. can provide you with high quality MDF doors on time and at an affordable price. We can manufacture and ship them in a raw finish for customization in the field or we can finish them in a broad range of colors and textures for a custom look at an off the shelf price. Call us today to discuss what we can do the help you with your MDF door needs.